If your recent graduate convinced you to let them go to Senior Week, don’t fret. 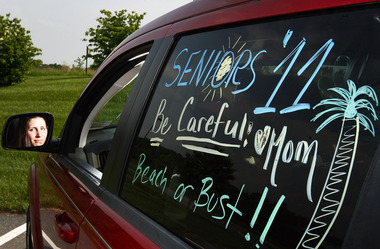 Senior Week can be a learning experience for graduates before they head off to college and, maybe more importantly, they could have the time of their lives. Chief Keith Banks of the Rehoboth Beach Police Department said over the years there’s been a growing trend of groups of parents renting hotel rooms in the area to keep an eye on their kids. 1. Set up rules regarding contact before they leave. Sit down with your recent grad before Senior Week and make a list of rules to follow. For instance, your child must answer their phone and be available to give parents a regular update. “If the majority of young adults agree to keeping in touch and not getting into cars with people or whatever rules they agree on, it’s probably going to be OK,” said Pauline Wallin, a licensed psychologist in Camp Hill. In addition to contacting them, be sure you have the contact information of the landlord or hotel manager that will be in charge while your child is inhabiting their space. It’s important to make contact with them beforehand so you know what, and who, you’re dealing with. 2. Give them “the talk.” No, not that one. Talk to your child (now a young adult) about responsible drinking and partying. Listen, thousands of students trek to the beach each year for a week and have a good time in a responsible way. Tell them stories about your glory days and warn them of what could happen if they exhibit irresponsible behavior. Underage drinking is a crime and can stay on their record or cause other unwanted repercussions, Banks said. Explain these potential ramifications to students and be sure they know the risks. 3. Encourage them to take care of themselves. Summer temps at the beach can get high and, if teens are adding alcohol to the mix, it can be a dangerous combination. Hydration, sleep and nutrition are vital for the young adults celebrating graduation. Encourage your kids to take care of their bodies while they’re having fun. Consider helping them out (they’ll love you for this) by donating a few pans of casserole, lasagna or other meals they can freeze and reheat for dinners they can enjoy with their friends. Pack the meals with foods high in nutrients, like spinach, so the kids can get a quick boost. Trust us, your son or daughter will eat a homemade meal from mom over boxes of Ramen noodles any day. They can do that in college. 4. If they’re headed to Ocean City, Md., push them to participate in the Play It Safe program. Jessica Waters, communications manager for the Ocean City, Maryland Convention and Visitors Bureau, said when she talks to parents, she encourages them to speak with their son or daughter about participating in Play It Safe Ocean City. In 2012, more than 8,500 recent grads took part in the initiative, a free program students can sign up for that offers concerts, laser tag, miniature golf and other alcohol-free activities that are a safe alternative to partying. In addition to the robust events calendar created specifically for the young adults, those who participate in the program get a free wristband that allows them to ride the bus for a week at no charge to them. 5. Don’t supply the booze. Whatever the reasoning is, don’t supply the booze for your seniors. Just don’t do it. If a party gets busted, police can track where the alcohol came from and you could get slammed with a charge of furnishing alcohol to minors – typically a misdemeanor charge. That means mugshots, fingerprints and a criminal record. 6. Try not to worry. If there’s a problem, police will contact you. If you’ve been over the rules and you’ve helped your graduate prepare, all you can do for the week is sit back and try not to worry. Inevitably, Wallin said, you will. If there are issues with your son or daughter related to partying or alcohol, police will likely contact you. Banks said police must contact parents if a person under 18 gets into trouble, but also will notify parents if they’re called even if the student is 18 or older.